Ok, so long story short, I think the IAU are just getting ridiculous with this planet classification thing. It got tiresome some time ago. Now it’s beginning to irritate me. What’s so bad about Pluto being a dwarf planet anyway? I mean, the Sun’s a yellow dwarf star. That doesn’t make it any less of a star, does it? Let me clarify this — a dwarf planet is still a planet. If a giant planet is still a planet, why should a dwarf planet be otherwise? And I’m sorry, but “plutoid” is a silly name, regardless of what it may or may not sound like! So I decided to create my own tongue-in-cheek semi-serious classification system. Because… well… because I can. So why not? I hasten to add that this is not a serious attempt at classification, and the lines are unsurprisingly fuzzy. Frankly, there are some glaring discrepancies in the IAU’s definition schemes. They seem to be clutching at any way of keeping the 8 classical planets as planets and excluding anything else. This is unscientific at best. I devised this scheme as the most logical system based on current human knowledge. The name Apollo is to fit with the planets being named after Roman gods and godesses. It seemed appropriate. Any object in an astrophysical environment capable of exerting non-negligible gravitational force is termed a “Celestial Object” (hereafter referred to as “celestials”). Celestials may be broadly subdivided into two types: Planetary and Stellar. A celestial is defined as a stellar object if it has sufficient mass to initiate fusion of any description. All celestials are classified by mass and not orbital characteristics. My scheme bases classification primarily on mass, and how it (and contributary factors) define the characteristics of a celestial. A star orbiting a more massive star is still a star. Therefore a planet orbiting another planet should logically still be a planet, though the terms “moon” or “natural satellite” still apply; being a moon should not exclude a celestial from being a terrestrial or even a giant planet. This may also apply to stellar objects, thus by this classification Alpha Centauri B would be a “natural satellite” of Alpha Centauri A. Both, clearly, are still stars. Each of the 2 categories has one “sub” classification. 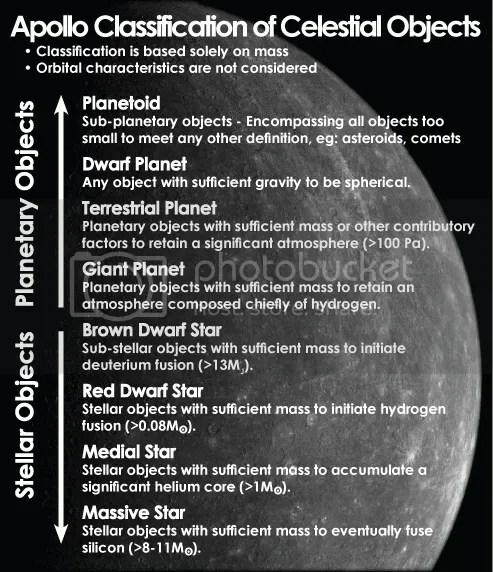 A Planetoid is too small to be a true planet, and a brown dwarf is too small to be a true star. And yes, by this definition, Mercury is a dwarf planet, along with Pluto, Ceres, Eris et al (not forgetting Sedna this time either) — but they are all still planets. On the other hand, Titan is classified as a terrestrial planet, while still being a moon. The case could be argued for Triton too, whose atmosphere is about 70-90 Pa in pressure. Further subdivision of categories is necessary, such as the subdivision of giant planets into gas giants, ice giants, hot jupiters etc. Likewise for stellar objects, the Harvard Classification of spectral types is not incompatible with this classification system. Many astronomers already group stars loosely into low-mass, intermediate and massive categories.